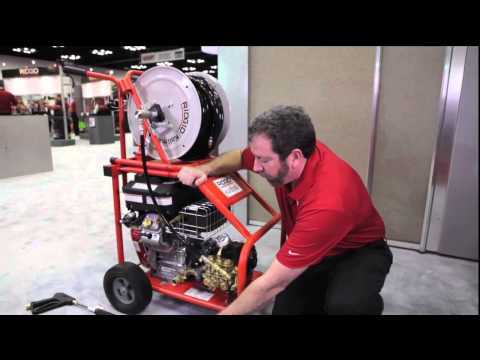 The RIDGID® Model KJ-3100 portable water jetter gives you 3000 psi (205 bar) actual working pressure to handle large commercial and industrial applications. This jetter propels a highly flexible and lightweight hose through 2" to 10" (50 to 250 mm) lines blasting through sludge, soap, grease, and sediment blockages. As you pull the hose back, it power scrubs the line flushing debris away and restoring drain lines to their full, free-flowing capacity – all without the use of harmful chemicals. Quick Start - 16 HP Recoil start gasoline engine starts easily. Features: ON/OFF switch; fuel shutoff; choke and throttle controls; easy access oil fill and dip stick. KJ-3100 Water Jetter is rated 4.8 out of 5 by 4. Rated 5 out of 5 by Plumbingtheworld from Commercial and industrial application. We were considering a trailer better but didn't have winter storage space so we chose the Ridgid 3100. We love it and have used it in commercial, residential, and industrial facilities. 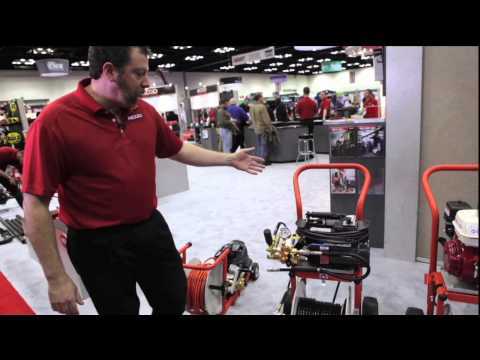 If you are looking for a versatile jetter that is portable this is the answer. I recommend the foot pedal also, so you can leave gas engine outside. Rated 5 out of 5 by DYates from Exceeded expectations After winning a bid to water jet miles of 4", 6", & 8" terra cotta sewer lines, we purchased the KJ3100. No mechanical drawings existed for the apartment complex sewer system and distance between manholes was just under 300', so we purchased the longer 300' hose. As you would expect, lots of grease and "flushable" products were blasted away and, with terra cotta came lots of tree roots. The Root Ranger nozzle handily cut them away. We followed with our Ridgid constant-level-image color camera to document and record the now clean-as-new sanitary sewer lines. NaviTrack allowed us to locate which way the underground lines run in order to provide a detailed map of the underground sanitary sewer system. My initial concerns regarding the high-pressure and terra cotta were unfounded and no piping was damaged. The power spray wand came in handy to blast away heavy rings of grease buildup within the manholes. The KJ3100 performed better than anticipated, which allowed us to do the work in less time than bid. Rated 4 out of 5 by lclements from This product has helped us tremousally. We have used the jetter an awful lot. And it has always come with ease and satisfactory. And we also have other ridged machines, like the sewer machine and sink machine. Whenever we need parts are supplier gets them to us quickly.